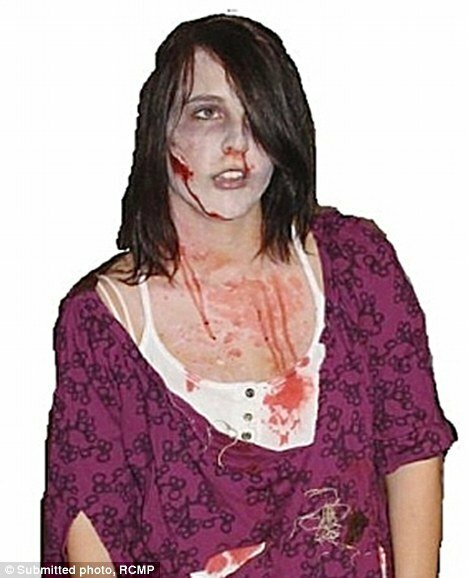 Taylor Van Diest, a teenager from Armstrong, British Columbia in Canada, who died after being beaten unconscious on Halloween was dressed as a zombie and covered in fake blood the night of her killing. Taylor Van Diest, 18, died in hospital on Monday. The teenager had been found unconscious near some railway tracks after a search by police, friends and family. Royal Canadian Mounted Police said on Friday there are still no suspects in the case. On Thursday police released a photo of Taylor Van Diest from Halloween night in the hope that it might produce some leads. Taylor Van Diest was supposed to meet a friend to go trick-or-treating, Canada.com reports. The teenager family contacted police after they got a call from someone who had found her cell phone. The girl was then reported missing, with the family telling officers the last time they spoke with her was about 7.30pm. RCMP spokesman Gordon Molendyk said that police have now assigned 40 officers to the case. Family said Taylor Van Diest left her home at 5:50 p.m. on Monday and headed to the railway tracks which are about 10 minutes away. Gordon Molendyk said he did not know if she met someone there or was followed. Gordon Molendyk said police are now checking her phone for clues. “We are pulling all available resources that we can put into this case. “We want to solve this crime,” he said. The spokesman added that police are waiting on an autopsy report before they can any information on how Taylor Van Diest was killed. halloween murder of ateenager armstrong.